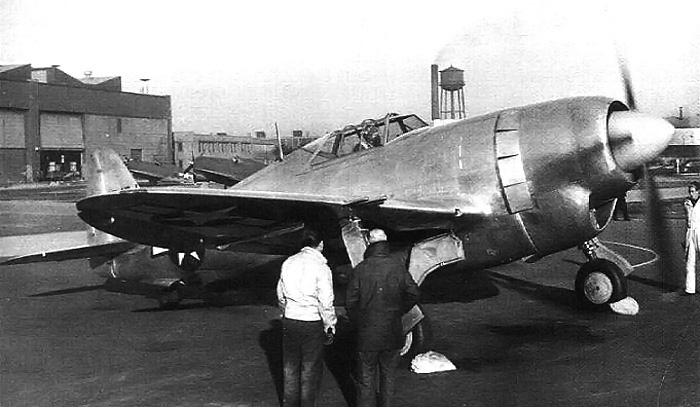 An early image of the Republic XP-47J before the Superman nose art was applied. Note the cooling fan vanes around the spinner inside the cowling. As with all P-47s, Alexander Kartveli was the main designer of the XP-47J, and he was assisted by Murray Burkow. 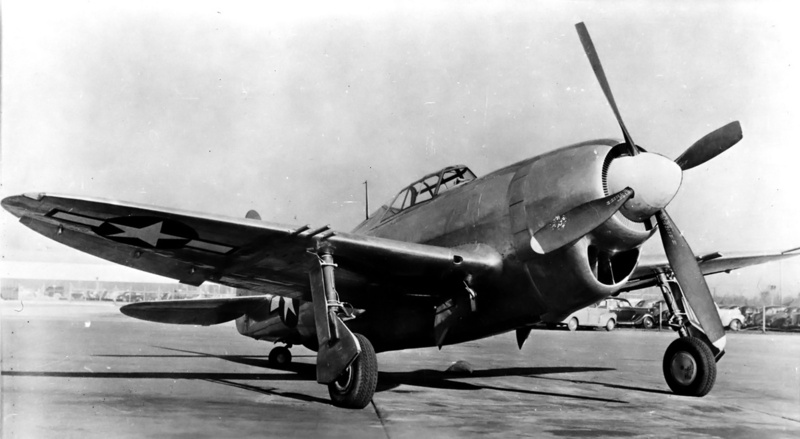 The XP-47J was similar in appearance to a P-47B, but it was a completely new aircraft. The XP-47J had a close-fitting cowl installed around its Pratt & Whitney (P&W) R-2800 engine of increased power output. A large spinner was added, along with a fan to aid engine cooling. The turbosupercharger’s intake had been refined, and the flow of its exhaust was directed to provide additional thrust. Two of the .50-cal machine guns were deleted (leaving six) in the XP-47J’s lightened wing, and the rounds per gun were reduced to 267. Other weight-saving measures were the omission of radio equipment and the aft fuel tank. To keep the aerodynamics clean, the XP-47J had no provisions for external stores under the wings or fuselage. 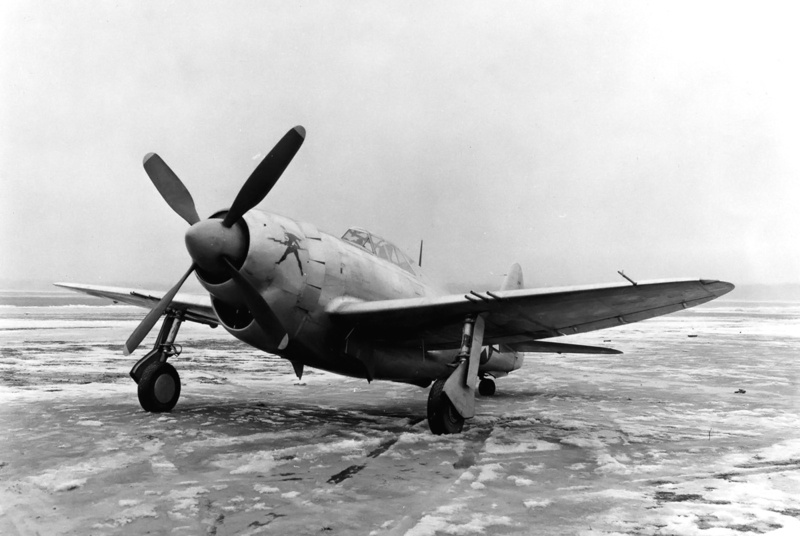 Originally, the AAF wanted the XP-47J to have contra-rotating propellers and a bubble canopy, like a late P-47D. To expedite the XP-47J, the decision was made for the first prototype to be a razorback version and the second prototype would include a bubble canopy. 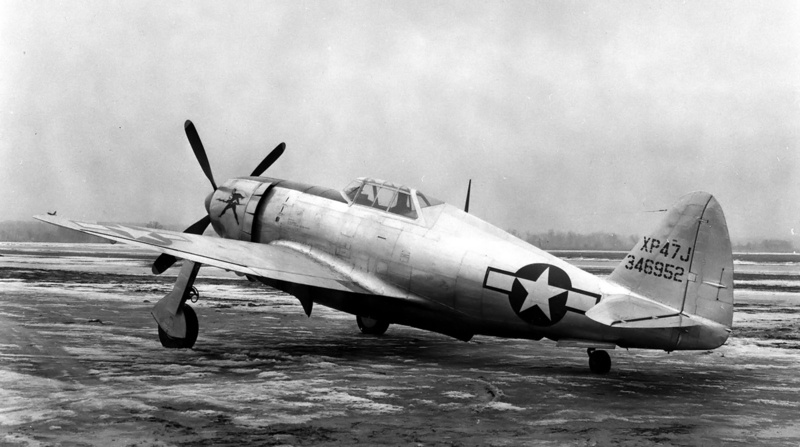 The six-blade contra-rotating propeller was test-flown on a P-47B but showed no increase in performance. This, combined with delays at P&W on the R-2800-61 engine with a contra-rotating gear reduction, resulted in the substitution of a R-2800-57 engine with a standard gear reduction. Both the -57 and -61 engines were rated at 2,100 hp (1,566 kW) and had a War Emergency Power (WEP) rating of 2,800 hp (2,088 kW). The -61 engine would be supplied later, when it was available. The engine, cowling, and cooling fan were installed and test flown on a P-47D-15. The Republic XP-47J, now with the Superman nose art. Some differences from a standard P-47 are the additional plexiglass panel behind the pilot and the lack of intercooler exhaust doors on the sides of the rear fuselage. The XP-47J had a wingspan of 40 ft 10 in (12.4 m) and a length of 33 ft 3 in (10.1 m). The aircraft had an empty weight of 9,663 lb (4,383 kg) and a design gross weight of 12,400 lb (5,625kg). Its service ceiling was 45,000 feet (13,716 m). The XP-47J had a range of 765 mi (1,231 km) at a cruising speed of 400 mph (644 km/h) and a range of 1,070 mi (1,722 km) at optimum cruising speed. Fuel capacity was 287 US gal (1,086 L). On 31 July 1943, Republic issued a report comparing the estimated performance of the XP-47J with the P&W R-4360-powered XP-72 that was under development. The report concluded that the Republic XP-72 had more potential and recommended resources be focused on that aircraft. In addition, 70% of the P-47 production line needed to be re-tooled in order to produce the P-47J. Republic called for the cancellation of the second XP-47J prototype but encouraged the completion and testing of the first prototype. The AAF approved Republic’s plan and cancelled the second XP-47J. The sole XP-47J prototype (serial number 43-46952) was completed in mid-November 1943 and made its first flight on the 26th of that month. The aircraft was quickly dubbed Superbolt and wore nose art on both sides of the cowling of Superman holding a lightning bolt. After about 10 hours of flying time, the R-2800-57 engine was making metal and was replaced by another engine of the same type in February 1944. The factory-fresh Superbolt is being run-up outside of Republic’s plant in Farmingdale, New York. Unlike a standard P-47, the intake under the engine was separate and pushed back from the front of the cowling. A short time later, P&W informed the AAF and Republic that the R-2800-57 engine was not compatible with the 2,800 hp (2,088 kW) WEP rating. A water-injected R-2800-14W was substituted in the XP-47J in April. Water injection is a system that sprays anti-detonation fluid (a mixture of alcohol and water) into the induction system to lower the charge temperature and prevent detonation in the cylinders. This allowed the -14W to produce 2,800 hp (2,088 kW). In March, P&W informed Republic that it was still having difficulty with the R-2800-61’s contra-rotating gear reduction and did not know when the engine would be available. This effectively put an end to the possibility that the XP-47J would have contra-rotating propellers anytime in the near future. On 11 July 1944 and equipped with a General Electric CH-3 turbosupercharger, the XP-47J achieved 493 mph (793 km/h) at 33,350 feet (10,165 m). Although the engine was producing 2,800 hp (2,088 kW), Republic believed the aircraft had more potential. At its own expense, Republic installed a CH-5 turbosupercharger and a larger 13 ft (3.96 m) Curtiss propeller. The propeller was an experimental unit with 2 in (51 mm) added to its trailing edge to increase its width. With the changes, the engine producing 2,730 hp (2,036 kW), and 400 lb (1.78 kN) of jet thrust from the exhaust, Mike Ritchie flew the XP-47J over a calibrated course at 34,450 (10,500 m) feet on 4 August 1944* and achieved 505 mph (813 km/h). This is the highest speed recorded in level flight by any propeller-driven aircraft during World War II. This side view of the XP-47J reveals its distinct intercooler air and exhaust exists under the rear fuselage. The XP-47J was handed over to AAF and arrived at Wright Field, Ohio on 9 December 1944. During flight tests, the AAF was unable to get maximum power from the R-2800 engine. The AAF recorded a speed of only 484 mph (779 km/h) at 25,350 feet (7,727 m) and with the engine producing 2,770 hp (2,066 kW). Near the end of flight testing, the exhaust manifold system had a serious failure while the aircraft was at 36,000 ft (10,943 m). The cause of the failure was the increase in pressure and temperature from the CH-5 turbosupercharger acting upon the unstrengthened exhaust system. The Official Performance Summary report states the XP-47J had a max speed of 507 mph (816 km/h) and a 4,900 fpm (24.9 m/s) initial rate of climb. Republic’s Test Report No. 51 (27 January 1945) lists the max speed as 502 mph (808 km/h). While the XP-47J Superbolt had remarkable performance, it was overshadowed by other aircraft, like the XP-72, that were under development. Work on the XP-72, which first flew on 2 February 1944, was not far behind that of the XP-47J, but as the war progressed and with the advent of jet fighters, neither aircraft were needed. *Mike Ritchie’s report recording the 505 mph (813 km/h) speed was dated 5 August 1944, but it is believed the flight actually occurred on 4 August 1944. The six wing guns are evident in this image of the 500+ mph Republic XP-47J Superbolt. This entry was posted in Aircraft, World War II on 17 December 2013 by William Pearce. Mr. Pearce, Thank you for this interesting article. You are quite correct; the record-breaking 505 mph flight (classified at the time because of its military sensitivity) was made on August 4th, 1944. I have primary source material because my late father, Mike Ritchie, was the pilot. For those who may be interested in the human dimension of the pre-jet aviation speed records, this was just another day at the airfield for my father, minus the photo op with the company president and the Air Force VIPs. He was a modest man doing what he enjoyed; testing aircraft. He took aviation engineering classes at night while working full time, and met and married my mother, a draftswoman at Republic who also collected pilots’ flight cards. 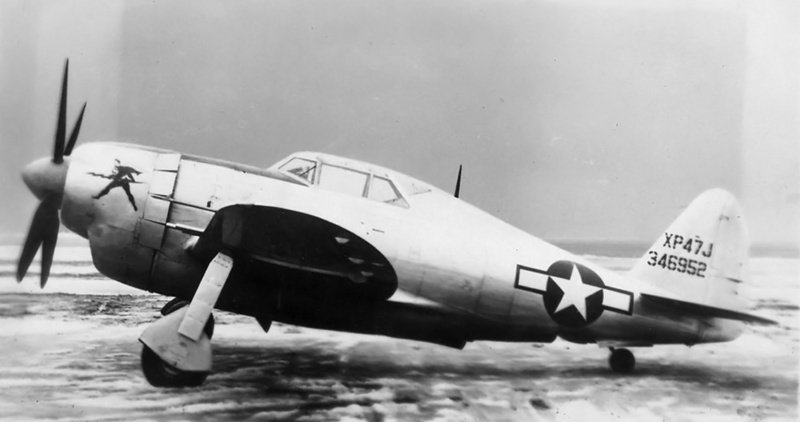 The ‘Superbolt’ moniker was part of the early marketing of the P47J (faster, lighter, etc). But the nose art was subject to change. I have photographs suggesting that Superman was hastily repainted over a curvaceous blonde ‘Gravel Gertie’ image on the nose, before the plane’s moment in the sun. Early political correctness at work perhaps? It is easy to forget the danger these brave pilots (at the time only men) risked daily in experimental planes. The tail of a new plane Mike flew in 1949, the XTB3F-1 “Guardian” broke apart, killing his flight engineer. He parachuted out at high speed and low elevation, but landed on top of the crash, breaking 3 bones and spending 2 months in the hospital. Fortunately my father recovered and went on to work on Grumman’s lunar module project among others. He also had four more children including me, seven in total. I never learned of my father’s longstanding speed record until after it was broken (45 years later in 1989 by a souped-up, larger engine version of the Grumman Bearcat, another plane Mike flew). He casually dropped mention of it into dinner conversation, explaining the limitations of the piston engine/propeller driven aircraft. Apparently the wings of the “Jug” were awesome. My mother didn’t even look up , just kept eating her broccoli (she claimed she never worried about dad when he was at the office). In 1994 on the 50th anniversary of the record setting flight, a dinner was held on Long Island to honor the contributions of the team of designers, engineers, mechanics, and pilots who guided the Thunderbolt program and its contributions to the Allied victory and aviation history. Dad was surprised to discover he was among the guests of honor. He greatly enjoyed seeing some old friends there. Unfortunately lymphoma and Parkinson’s disease combined to take his life three months later at age 80. A former naval aviator, he’d survived hundreds of flights in a total of 18 experimental and new planes (not counting minor model modifications). Mike was one of 7 Ritchie brothers who served in the US armed forces during World War II and the Korean War, all of whom returned safely. The Greatest Generation served with such valor and humility. From biplanes, stellar navigation and unpressurized cockpits to lunar landing craft engines, his lifetime ran parallel to the golden age of aviation. Thank you for the opportunity to affirm details and contribute this remembrance of my personal aviation hero: M. Michael Ritchie 1914-1994. Rest in peace. I thoroughly enjoyed reading your post. Accurate information on the XP-47J is hard to find, and first-hand accounts like yours are invaluable to the preservation of its history and the memory of those involved. Thank you very much for taking the time to write up such a fascinating message. You are most welcome. It’s fun to help keep history alive for all those interested in it. WOW, you are proud of your Dad and should be. We had a summer place at Babylon at the beach. I was thrilled by the test flights and “dog fights” with the Grumman guys. Talk about a good time.LOL. Thank you both for filling in a large gap in my knowledge of aviation history. I have loved airplanes and flying all my life and continue to be amazed at the accomplishments of Golden Age and The Greatest Generation. A friend of my family was a fellow named Dean C. Smith. He flew mail in the 1920’s with Charles Lindbergh, was a pilot on the first 2 Byrd expeditions and became the first pilot at American Airlines (Seniority #1). Thanks to him I became a professional pilot, with a career in airplanes and helicopters for almost 50 years. May you always have clear skies and the wind at your back (except, of course, on landing). Thank you for the kind words and I’m glad you liked the article. Thank you, Beth for contributing your part of the history of “the Jug”. My father was an engineering test pilot at Nadzab, New Guinea during World War II. The P-47 was among the many aircraft types he flew in that position and in combat. He had a great fondness for “The Jug”, as did many other pilots, and was greatful for its rugged construction. Later in life he told me of his experience testing the P-47 in a terminal velocity dive and encountering compressibility while exploring recovery techniques. An excellent article and I appreciate the comments from the other readers which are an education, too!